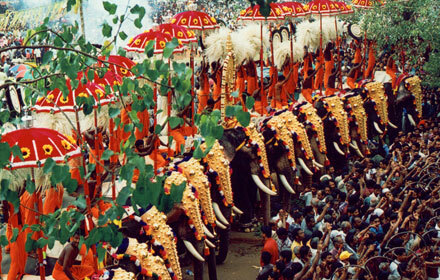 Kerala is a perfect destination for nature, culture and relaxation. With its awesome beaches, tasty food, unseen and hidden natural beauty, adventurous elephant rides and gentle houseboat cruises along backwaters. There are many fascinating elements. Incredible Kerala -god’s own country called due to its characteristic and features covering all which can attract even God apart human being. This tour introduce you ancient relation between countries, trade relation of India with Arabs, Roman and travellers. Incredible Kerala will introduce you essence of natural beauty, unmatchable beaches, Beautiful landscape, true rural culture, tasty and unique food, Sprawling plantations and paddy fields, Lush hill stations and exotic wildlife and many more. Cochin: Cochin also known as Kochi (colonial name Cochin) is a vibrant city situated on the south-west coast of the Indian peninsula in the breathtakingly scenic and prosperous state of Kerala, hailed as ’God’s Own Country’. Cochin is proud of its world class port and international airport that link it to many major cities worldwide. Munnar: One of the most popular hill stations in India, Munnar is situated at the confluence of three mountain streams - Mudrapuzha, Nallathanni and Kundala. Surrounded by almost 30 tea gardens that give it a picturesque view, Munnar is near Anaimudi, the highest peak of the Kerala Western Ghats. Thekkady: During 1899 under British rule, the core area of today’s Periyar Sanctuary was declared as a reserved forest in order to protect the catchment area of the Periyar River. The total area of the present Sanctuary is 777 square kilometres and it is located in the southernmost part of Western Ghats. 70% of it includes tropical evergreen and semi-evergreen forests. Kumarakom: Kumarakom is a cluster of little islands on the Vembanad Lake and a picturesque, clean village like most places in Kerala. 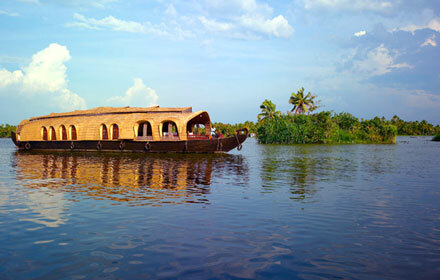 Alleppey: In Alleppey entire district is endowed with immense natural beauty. The sandy strip of land with Arabian Sea to its west is woven by lagoons and an array of rivers, canals, and lakes ideal for boat cruise. Kollam: Kollam was an ancient port city on the Arabian coast. This town have a rich coastal history that even made the famous ancient travel writer Ibn Batuta to refer this port as one of the five important port in the 14th century. 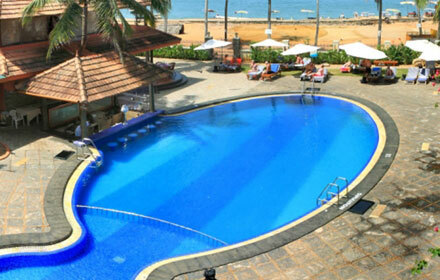 Kovalam: It lay in humble obscurity along the picturesque coast of Kerala. 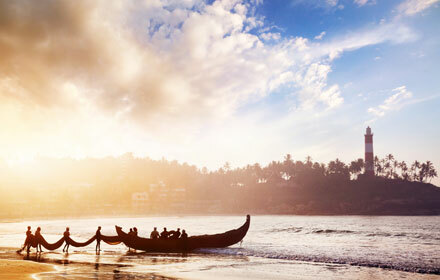 Kovalam is reckoned the most trendy beach retreat in India. Fly from London to Cochin. On arrival at the airport, meet your representative who will take you to hotel. Overnight at Hotel. Early morning, if you wish, you can wake up early to feel beautiful sights of sunrise over the Chinese fishing nets. 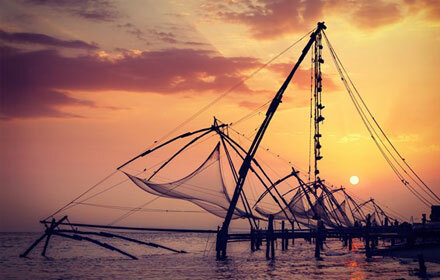 The expanse of nets with the backdrop of sun rising is a perfect start to enjoy the scenic beauty of India. After breakfast we will set out to explore this port city with rich and interesting past. The Chinese, Jews, Arabs and Europeans sailed into this city to trade and impact still can be found in this city. We will walk through the Fort area, exploring Jewish Synagogue – which is one of the oldest synagogue amongst all the commonwealth nations, St Francis church, Dutch Palace or Mattancherry Palace - a 16th century palace. Just opposite to the Mattancherry Palace, visit the spice market, one of the biggest centres of spices in Cochin. In the evening we will take you to Kerala’s local dance performance show called Kathakali, which represent rituals and based on historical story. Overnight at Hotel. Morning breakfast and drive to Munnar from Cochin - hill station at a height of 1525 mtrs. Upon arrival, check in at hotel. 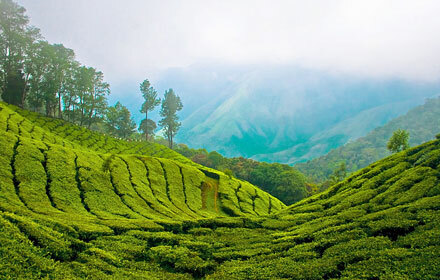 Munnar offers a breathtaking view of the hills swathed in an impossibly green carpet of tea bushes. 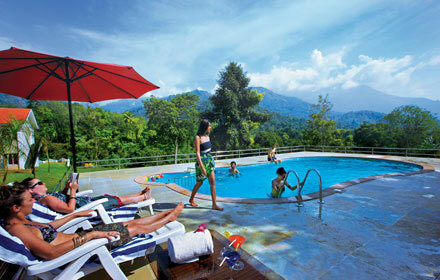 Munnar - the right royal resort lazily nestled in the verdant slopes of tea country. Munnar is blessed with greenery, forest with rich in flora and fauna. Overnight at Hotel. After a leisurely breakfast proceed on a sightseeing tour of the city which is difficult to describe. Visit tea gardens spread like a green carpet over hundreds of kilometres, lush green hills, very low population and far from pollution. The place is encircled by wooded hills of the Annamalai Ranges, with the towering bulk of Anamudi, which is peninsular India’s highest peak at about 2695m. Sprawling tea plantations, picture books towns, winding lanes, exotic flora and fauna in the forests and grasslands, make Munnar a pleasant hill station. Visit Mettupetty dam and Return to the hotel. Overnight at Hotel. After breakfast, we drive through the Western Ghats to Thekkady, a beautiful area of tea gardens, rubber estates, rich with coffee and pepper plantations, located high in the Cardamom hills. On our way we enroute visit the Tea Museum opened by the Tata Tea group. Upon arrival, check in at hotel. In the afternoon, visit a spice garden where you will be introduced to different spices and shown how some of the spices are grown. Overnight at Hotel. We wake up early to experience a boat cruise on the Lake Periyar, which show cases a kaleidoscope of activities that incur around the lake and jungle. Evergreen moist forests and savannah grass lands characterise Periyar. Later proceed to view the rare species of plantations, animals and visit a spice plantation growing cardamom, pepper, coffee, and tea estate. Walk amidst the palette displaying variant shades of green, neatly arranged into terrace farms, the symmetry broken only by the sudden appearance of a gurgling stream. It is believed that the spice trade dates back three thousand years in Kerala and many spices find their home here. 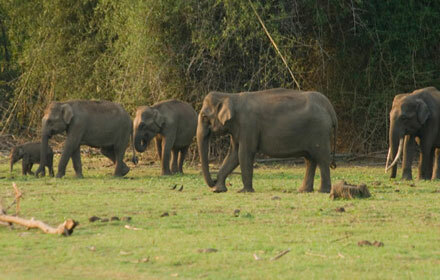 We’ll arrange an Elephant ride for you through forest to enjoy nature closely. Overnight at Hotel. After breakfast proceed to Kumarakom, set in backdrop of the Vembanad lake which is largest lake of Kerala. Kumarakom is a land constructed by the deposition of mud and other materials through natural and man-made methods. Upon arrival, check in at hotel. Afternoon visit Kumarakom bird sanctuary fill with different species of local and migratory birds. Overnight at Hotel. After breakfast drive to Alleppey and board the houseboat; while sailing enjoy palm fringed narrow canals winding through the vast expanse of paddy fields, several small village situated on small Island. You can have stop over on some scattered island, canals, panoramic sights one can never forget. Flocks of ducks swimming around the banks and tiny birds flying across the sky remain an enduring picture reflecting the charm of this beautiful land. Enjoy fishing and sunset when heading towards Alleppey. Overnight on houseboat. After breakfast travel to Kollam, also known as Quilon. Kollam has had a strong commercial reputation since the days of the Phoenicians and Romans. The Malayalam Era is based on the founding of Kollam in the 9th century and being one of the oldest ports of the Malabar Coast. It was an important centre of trade during the ancient times and was frequented by Phoenicians, Persians, Romans, Arabs with also famous travellers like Marco Polo. The historical importance of the place also stems from the fact that the township was designed and built by Syrians. Upon arrival, check in at hotel. Afternoon visit Thenmala- The first Eco Tourism setup in India rich with scenic beauty and adventure sports. Overnight at Hotel. After breakfast, visit Thangasseri, is a picturesque seaside village with a three kilometre long beach on which stands 144 feet tall lighthouse—a silent sentinel warning seamen since 1902 of the treacherous reefs. 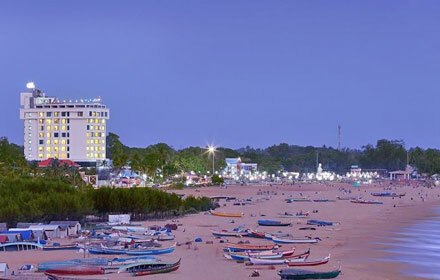 Kollam is blessed with all unique features; sea, lake, mountains, plains, streams, rivers, backwaters, forest, vast green fields and tropical crop of every variety. At the many temples, mosques, churches of this town, one can meet people eager to share their stories and monuments. Rest of the day is free to enjoy by own. Overnight at Hotel. After breakfast, travel to Kovalam a site enriched with rich greenery of palm fingered bays in secluded coconut groves and laced with golden sands. The boundless blue waters of the Arabian sea and miles of white sands washed away by the surf at the feet of the strong palms and the rocky promontories, makes this beach a paradise. Upon arrival, check in at hotel. Rest of the day to enjoy on the beach. Overnight at Hotel. Morning breakfast and excursion to Kanyakumari- there were commercial relations between western India and Alexandria, the chief eastern emporium of the Roman Empire. They identified Kanyakumari along with the Gulf of Mannar as a centre for pearl fishery. Visit Thanumalayan Temple from outside which was built in 17th Centuries with fine carving. Vivekanand Rock memorial- The memorial stands on one of two rocks located about 500 meters east off mainland of Vavathurai, India’s southernmost tip. It was built in 1970 in honour of Swami Vivekananda who is said to have attained enlightenment on the rock. Evening back to Kovalam. Overnight at Hotel. 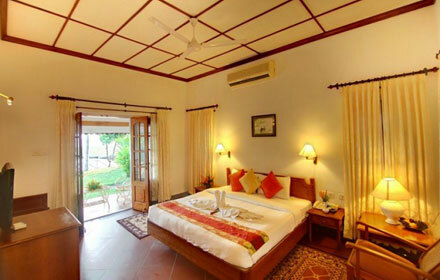 Have a leisurely breakfast, enjoy Ayurveda massage and can opt other option by own and relax on the beach. Overnight at Hotel. After a leisurely breakfast, check out and transfer to Trivandrum Airport to board the flight for your onward journey. ** £ 275 extra during Peak season including Xmas and New Year Gala dinner supplement. *Peak Season is from 20th Dec to 10th Jan.
*Rates are Per person with minimum 2 pax travelling together. 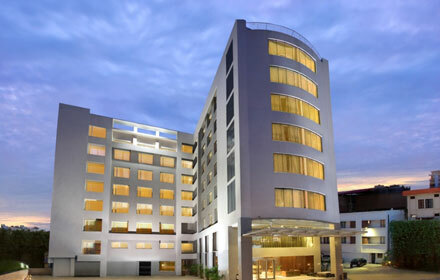 A business hotel, Kochi’s first ecotel Beaumonde The Fern, Kochi which is located in the city centre of Ernakulam, the commercial capital of Kerala strives hard to adhere to the go green factor. Our hotel in Kerala which is owned by KGB’s Hospitality & falls under the well-known brand of Fern Hotels and Resorts presented by the Concept Hospitality Limited is set amidst lush green surroundings & offers peace and tranquility to the guests. 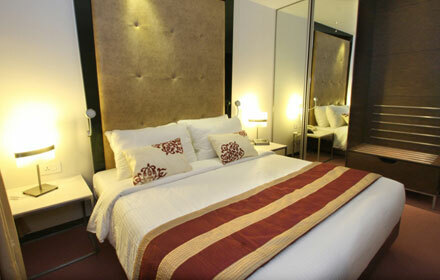 The hotel is well equipped with modern facilities and eco-friendly toiletries. As an eco-friendly initiative, all the rooms in our hotel come fitted with energy saver panel. Get refreshed by being in the rolling hills, lush green plantations, exotic wild nature and stunning frozen waters. Broad Bean Resort & Spa being one of the best hotels in Munnar offers you a wonderful experience of the queen of hill stations. Broad Bean is an ideal place for you to lie back and relax in the lap of nature and natural beauty. The hotel resting in the lap of evergreen hills provides you with a mesmerising view of Sahyadri with thick canopies of trees which blankets the mountain ranges. The sight of luscious emerald plantations with sunlight dancing on the leaves is the best one could enjoy being in the luxurious of the place. The freezing climate of Munnar which creates an ambience where white cloudy fog blankets the hill stations adds up to your experience of being in one of the best resorts in Munnar. Poetree is located at a unique vantage point on the top of a hill and embraced by acres of untouched land and forest. Set in the midst of these high ranges, you will be able to take in unparalleled views of Thekkady’s dazzling sunrises either from the comfort of your room or from our viewing deck atop the main block. Backwater Ripples, the luxury lake view resort contains traditionally designed independent luxury villas, heritage cottages and Lake view and Garden view rooms. Most of these rooms have an outstanding view of Vembanad Lake, and has their veranda and private garden to add beauty to this lush. A backwater cruise on a houseboat allows you to see the scenic man made islands and beautiful sights of coconut fringed backwaters and paddy fields. Thehouseboats are luxuriously equipped with all of the modern amenities you would need. There are single-bedroom & even four to five-bedroom houseboats available, with living rooms, bathrooms, an equipped kitchenette & air-conditioning too. A well trained crew of a cook and a bearer along with two oarsmen will be at your service all through. 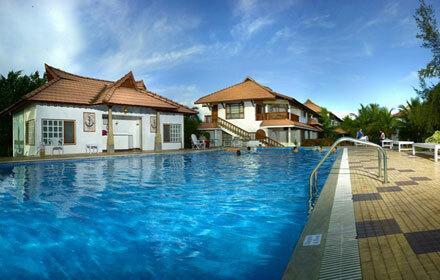 The Quilon Beach Hotel & Convention Center is located at Kollam, facing Arabian Sea and the Backwaters. 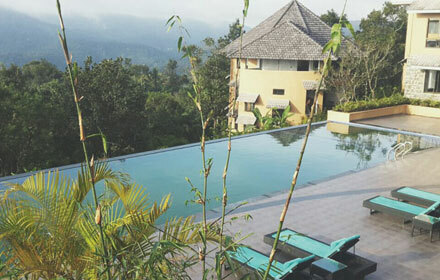 The luxurious hotel offers spa facilities and a swimming pool. Enveloped in serene Kerala backwaters, flanked by the Arabian Sea on the East and the majestic towering Ghats to the West, opening out to the ocean and a dream golden beach, Poovar Island Resort is a tropical paradise. Swaying coconut palms, endless golden sands, the ultramarine of the ocean, emerald backwaters, crimson sunsets and lush green vegetation create a magical ambience around you. Our distinctive Kerala resort is the ideal remote getaway location for a quiet holiday in spectacular natural surroundings. You can choose between floating cottages and land cottages for accommodation at our charming Kerala ayurveda resort and enjoy a boat cruise along the palm-fringed shores of bewitching backwaters. Additional sightseeing or usages of vehicle not mentioned in the itinerary. I authorize travango.co.uk to contact me.